Well that didn’t work well! The Etrex 30x has an “automotive mode” and the ability to navigate along roads and paths. It seemed to guess I was on paths as it offered a cycle path in its routing, though I don’t know where I set that. It set it to its automotive “Profile” and asked it to navigate into town. The map display showed the typical automotive perspective satnav view and a huge picture of the sun with a note on how long before sunset. The sun image really shrunk the amount of visible map so I soon changed that by changing the “dashboard” setting. 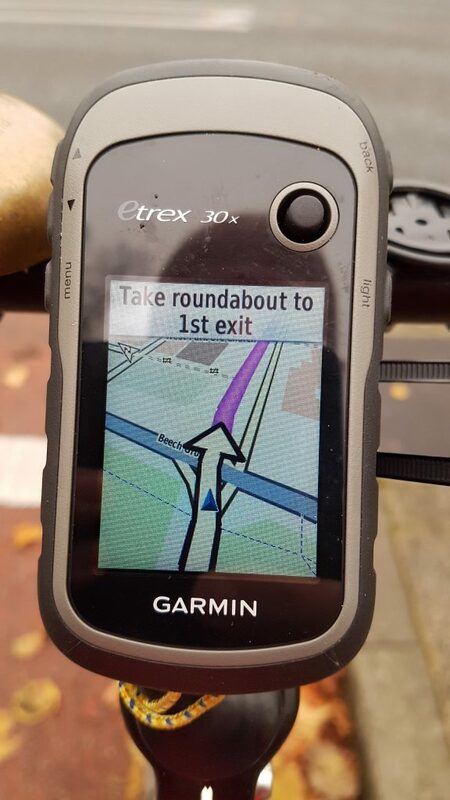 In retrospect perhaps there is a reason Garmin wanted to shrink the map display. The start of my route passed through a trading estate which, while accessible by bike, was not accessible by car. 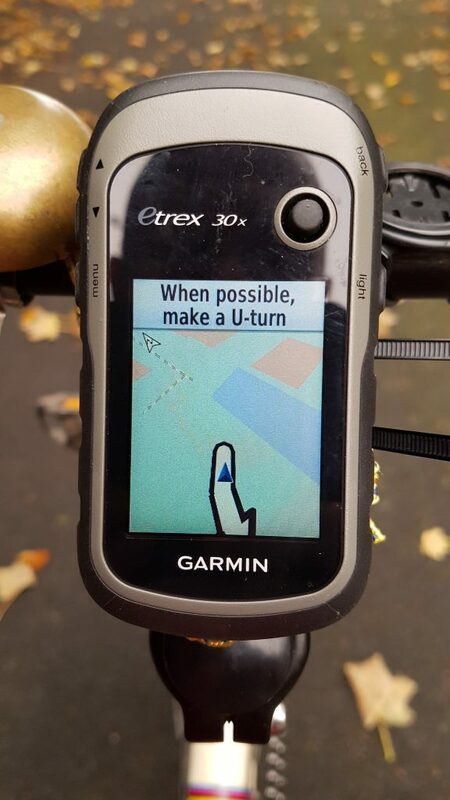 I didn’t expect to be seeing “Make a u turn” on a bike, something that reminds me of a children’s film and wants me to add the world “illegal” to the instruction. I kept cycling and it soon realised and recalculated for me. Suitably impressive. I reached the exit and was told to turn right towards town. Things soon became problematic as it was clear that it was not keeping up with my cycling speed. On the fast downhill it lagged well behind and I shot past the junction it wanted me to take. That was that! It crashed. For the next 5 or 10 minutes all I had was the word “Garmin” in the middle of a black screen. In the end I chose to go for a hard reset! 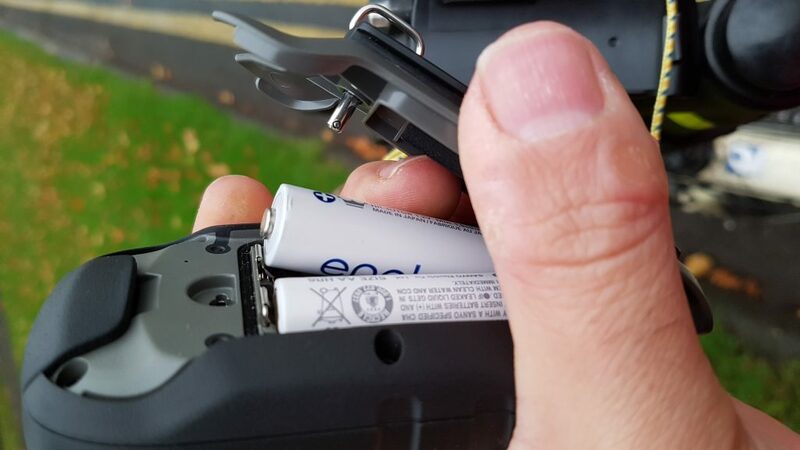 Hard resetting an Etrex 30! It came back up trying to follow some route that I couldn’t see. I was clearly well away from its planned course for me. So I asked it to re-route direct, then asked it to reroute on road and it was back. It has asked me to take the cycle lane. As soon as I joined it, this was the next instruction. The roundabout in question is quite some way ahead with a crossroads before it. There has been other evidence of bad data in the base maps before with Base Camp refusing to navigate certain routes. The map was generally 3 to 5 seconds behind reality, making it less useful for navigation at anything like a moderate cycling speed. It could get me there in a strange place at a pinch, assuming that the mapping is OK and it knows about things like one way streets (untested). But I’d have to slow right down for it to work and navigate those sections at walking speed. Adding “distance to next” to the data fields would help to tell me how far I can ride before having to slow right down. New map updates seem quite frequent so maybe the data will get there. I assume it is using Garmin’s map not OpenFietsmap which is also installed. It’s also not showing the OS Map that I have for this area. I could test with the memory card removed to see if that fixes the problems. I can hope that, as for other Garmin devices, firmware updates will fix issues. I’ll add an update here – as I found a way of making it work better.